City: Recife, capital of the State of Pernambuco. Actually, the stadium is located in the city of Sao Lourenco da Mata, in the metropolitan area of Recife; Sao Lourenco has no airport and poor travel infrastructure, hence the attendants of the Cup should stay in Recife. Pernambuco is one of the most traditional States of the Brazilian football championships, so it was clear from the beginning that a host city should be here. However, two cities claimed the post: Recife (where free terrains are few and expensive) and Olinda (where there is plently of free land – but the pride of Recife would not accept as location of the new stadium). An area in the border of the cities was the first attempted location – but the cost of buying the land proved to be prohibitive. Sao Lourenco was then chosen as a compromise solution; the arena will be built in public lands. Origin of name: named after the State, Pernambuco. The first name was Arena Capibaribe, after the big river which cuts the region. The Government of Pernambuco signed a PPP contract with Odebrecht to build not only the Arena, but a whole complex called City of the Cup, which will include residential and business towers, hotel, shopping center, etc. (no other host city will have anything comparable). American entertainment group AEG will operate the Arena. Because there will be private investments and professional management, it is unlikely that Arena Pernambuco would become an underused white elephant after the Cup; one of the major clubs in Recife, Nautico, already signed a contract to stage matches in the Arena; besides, Recife is one of the fastest growing regions in Brazil (much thanks to the industrial complex of Suape), and is attracting more and more (and bigger) events. Estimated cost: R$ 495 million. Matches and teams: Recife will host five matches of the World Cup. The teams are not defined yet, but it is known that the Brazilian team will not play in Recife. The Dutch (who occupied Recife for 27 years) and the British (who had many business in the city in the beginning of the 20th century – so much that a British cemitery was created) have strong connections with Recife. Recife can still be one of the hosts of the Confederations Cup, in 2013, provided that the works be finished before December 2012. Above: Cidade da Copa project; by 2014, only the Arena and a few buildings should be ready; the full project will extend for many years. Two photos above: circa January 2012. Notice that not only a stadium, but an entire city is being built; the Government and FIFA claim that the stadium will be ready by January 2012. Notice also the city of Recife, far in the background. Image above: in February 2012, Odebrecht informed that the works were 30% done and released new images of the stadium; the holes in the structure will allow light to shine from inside out. » World Cup in Recife (read also information in Portuguese). » World Cup 2014 Brazil. City: Natal, capital of the State of Rio Grande do Norte. Official name: Arena das Dunas – Estadio Joao Carlos de Vasconcelos Machado. Origin of name: Natal is known as City of Dunes; all the Brazilian coast from Rio Grande do Norte to Maranhao is covered by dunes (the dunes of Lencois Maranhenses attract tourists from all over the World). Joao Carlos de Vasconcelos Machado is the engineer who designed the old stadium, popularly known as Machadao. It is not certain yet whether the new arena will maintain the old name. Design: Populous (formerly HOK Sport Venue Event). Estimated cost: R$ 400 million. The budget of Arena das Dunas is the most uncertain of all venues of the World Cup 2014. First off, the initial project was totally changed. The image at the top of this page shows that the project included the construction of the stadium, the reconstruction of the entire Government administration, and the inclusion of a complex of hotels, business towers, etc. Today, the stadium alone (see image below) would make everybody happy enough. In March 2010, the Government was still thinking how to conduct the bidding. The first tender had no bidders (November 2010). It was only in March 2011 that the constructor (OAS) was defined. Rumors go that, to not run the risk of staying out of the Cup, Natal was very generous with OAS; the newspapers inform that the total cost of the stadium would fetch R$ 1 billion. Matches and teams: Natal will host four matches of the Cup 2014, all in the first stage. The most important teams in Natal do not play in the major divisions, and very rarely are they capable of bringing 10,000 fans to the stadium. Natal is a certain candidate to host one of the white elephants of the World Cup, once the event is finished (the other ones will be in Cuiaba, Manaus and Brasilia). The eight teams which will play in Natal are not known yet, but it is certain that the Brazil team is not coming. Two countries have strong Historic ties with Natal: Netherlands (which invaded Natal back in the 1600s) and USA (many American soldiers came to Natal during the World War II); Dutch and Americans would have much to see. Above: the new project, much simpler than the original one (top of this page). Photo above: November 2011, when the demolition of the old stadium Machadao started. Above: Febrary 2012; Arena das Dunas was the most delayed of all stadiums of the World Cup 2014. » World Cup in Natal. City: Fortaleza, capital of the State of Ceara. Official name: Estadio Governador Plácido Castelo. Origin of name: Placido Aderaldo Castelo was Governor of the State of Ceara from 1966 to 1971; the stadium was built during his term in office. Notice that the name Castelao means also “big castle” in Portuguese; actually, most Brazilians associate the name of the stadium to a castle, rather than the Governor. Constructors: Galvao Engenharia and Andrade Mendonça. Estimated cost: R$ 520 million. Matches and teams: Fortaleza will host six matches of the World Cup and three matches of the Confederations Cup. The Brazil team will certainly play one match in Castelao, with good chances to play twice (there are two ways of Brazil playing the second match in Fortaleza: either if the team finishes second placed in the first stage, or if it finishes leader of first stage and wins the following match). A growing number of Portuguese, Spanish and Italian citizens have a second residence in Fortaleza; these countries could benefit from playing here. FIFA is happy with the fast pace of works in Fortaleza, and the city is a strong candidate to host the final draw of the World Cup 2014. Photo above: June 12nd 2011, when sectors of the Castelao stadium were imploded. Photo above: February 2012, when workers stopped working for two days, claiming better salaries. Photo above: October 2012; more than 90% of the works were done. Two photos above (source): December 16th 2012, Castelão is officially the first stadium of the World Cup Brazil to be ready for the event; President Dilma Rousseff had the honour of the first kick off, and didn’t miss the opportunity to deliver a highly overoptmistic speech about the chances of Brazil “to win the World Cup not only inside the stadiums, but also outside”. There was no official match; the first matches will be January 27th 2013. Below: a flight over the Castelão, a few moments before the inauguration. » World Cup in Fortaleza (also in Portuguese). City: Porto Alegre, capital of the State of Rio Grande do Sul. Official name: Estádio José Pinheiro Borda. Origin of the name: Jose Pinheiro Borda was a fan of Internacional SC who worked diligently to build the stadium; very few people call the stadium by this name, though. The stadium is known all across Brazil as the Beira Rio, which means “by the river”. The stadium was located by the river Guaiba (actually, a lagoon – see image above), which washes Porto Alegre. Owner of stadium: Internacional FC. This is one of the two private stadiums of the World Cup 2014 (the other one is Arena da Baixada, in Curitiba). In Porto Alegre, there was a discussion which didn’t happen anywhere else in Brazil: which stadium should host the matches of the Cup. The other important club in Porto Alegre is Gremio FBPA (Porto Alegre is the only city in the World with two World Champions teams), and the rivalry between Inter and Gremio is unparalleled, even in Brazil. Gremio is building a new arena, the Arena Gremio, which many say would fit best to the World Cup, and is in a more advanced stage of construction (Inter is struggling with banks to get funds to invest in Beira Rio). Gremio bidded to be the host, but the reasons why Inter was chosen were not revealed; given the delays in the Beira-Rio, Gremio lobbied to host matches in Arena Gremio; if not the World Cup, at least the matches of the Confederations Cup, in 2013. Design, architecture and engineering: Hype Studio; Santini e Rocha Arquitetos; Simom Engenharia. 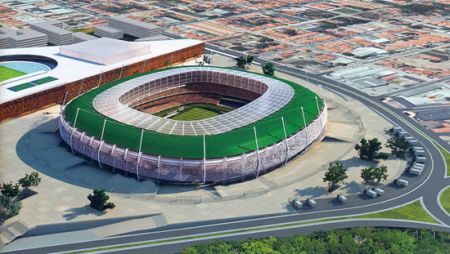 Estimated cost: R$ 290 million; because the stadium is privately owned, costs tend to be lower, but fewer details about the contracts will be disclosed. Matches and Teams: Porto Alegre will stage five matches. Nine teams will play in Porto Alegre (one team will certainly play twice). Teams are not known yet, but it is certain that the Brazilian team will not play in Porto Alegre. Below, the dates of the matches; teams will be published as soon as they become known. Photo above: January 2012. Very little had been done. » World Cup in Porto Alegre (also in Portuguese). Official name: Estádio Nacional Mané Garrincha (National Stadium Mane Garrincha). Origin of name: Brasilia is the Federal Capital of Brazil, hence many official buildings are called National, such as the National Theatre Claudio Santoro, National Museum Honestino Guimaraes and National Library. Mane Garrincha was a famous and popular Brazilian football player (he was a star in the World Cups of 1958 and 1962); he was nicknamed the Joy of the People, and many consider Garrincha better than Pele. Garrincha was not born and never lived in Brasilia. It’s worth notice that most of the National monuments in Brasilia were designed by Brazilian architect Oscar Niemeyer, the man who designed Brasilia. According to law, Niemeyer, who’s still alive, should be heard to give opinions on the design of the new stadium, if he so wanted, but he gave it up. Constructors: Andrade Gutierrez (also working in the Arena Amazonia, in Manaus) and Via Engenharia. Estimated cost: R$ 671 million. Matches and Teams: Brasilia will host seven matches, including the match for third place. The only other stadium to host seven matches is Maracana, in Rio de Janeiro, which will stage also the final match of the World Cup; all other cities will host less than seven matches. The teams are yet to be defined. It is already known, though, that the Brazilian team will play at least one match in Brasilia (a second match, only if playing for the third place). Map of Mane Garrincha stadium. More Photos of Mane Garrincha National Stadium. Above: in May 2011, the whole stadium was to be imploded, but, even after two attempts, part of the structure remained standing, and had to be demolished with tractors. Above: November 2012. The photo shows how redish the Brasilia soil is. In the background, one can see the TV Tower (center of image) and the twin buildings of the Brazilian Congress. » World Cup in Brasilia (also in Portuguese). » World Cup in Brazil.